Honestly, I hardly write reviews but this time I'm excited to. I just had my Lasik done with Dr Tran a few days ago. I was amazed that I was able to see a few hours after the surgery. The Lasik was super duper fast, less than 30 seconds an eye. Dr Tran is a caring, loving & knowledgeable Dr I ever met. I definitely recommend everyone to see her for your Lasik. Love it !!!!!! Laser-Assisted In-Situ Keratomileusis (LASIK) is a surgical procedure intended to reduce dependency on eyeglasses or contact lenses, and to improve quality of life. In fact, LASIK is now the most common vision correction procedure worldwide and it is performed on nearly 1 million patients every year. LASIK is performed to permanently correct myopia (nearsightedness), hyperopia (farsightedness) and astigmatism by altering the shape of the cornea to increase the eye's focusing power. LASIK can improve your vision after a 15-minute, painless procedure, and with a 95% success rate. Safety for LASIK is at the highest level it has ever been with the current technology. In qualified candidates, the risk of losing vision from LASIK is even less than with daily contact lens wear, according to a worldwide literature review in 2009. Why wait, when you can trust our experience to improve your vision today! At the American Eye Center, our top priority is outstanding patient care. That is why Dr. Nam Tran meets with each patient to determine his or her vision correction needs. Dr. Nam Tran supervises all necessary measurements and tests, while answering many of the patient’s questions. Based on the examination and test results, she determines which vision correction procedure—LASIK, PRK, implantable contact lens or cataract surgery—is right for the patient. 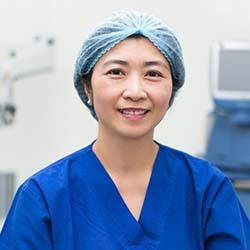 Dr. Nam Tran personally performs all of her own surgical procedures. After the procedure, she continues to meet with the patient for post-operative testing, measurements and follow-up care. By guiding the patient through each step of the process, we are able to individualize patient care, which results in greater patient satisfaction. Q. Is laser vision correction right for me? Every patient’s eyes are different. Some people are nearsighted (myopia) while others are farsighted (hyperopia), have astigmatism or difficulty reading (presbyopia). New advances in lasers have made it possible to treat such conditions with LASIK and PRK techniques that were unavailable even a few years ago. At the American Eye Center, we begin with a thorough eye examination to determine whether a patient is a candidate for vision correction surgery. Q. What vision conditions can be corrected with laser surgery? Patients with myopia are nearsighted, meaning they can see near objects clearly but things at a distance are blurred. Patients with hyperopia are farsighted, meaning they have good distance vision but close-up objects appear blurred. Astigmatism is a condition that can impair vision close up and at a distance. It occurs when the cornea and lens of the eye is oval in shape instead of round. This lets light entering the eye to focus at several points on the retina instead of one, causing blurring. Most patients begin to experience presbyopia, or “old-eyes,” in their 40s. This occurs as the eye lens hardens naturally with age and loses the flexibility to focus on close-up objects.